Panorama: A New Perspective – a selling exhibition featuring over 40 paintings and sculptures by the foremost names in Impressionist, Modern and Contemporary art – will open to the public from 29th March to 3rd April , alongside Sotheby’s Spring 2018 Hong Kong Sale Series. The show will be led by four powerful works by Pablo Picasso, spanning 50 years of the artist’s extraordinary career and all coming direct from the collection of the artist’s grand - daughter, Marina Picasso. These will be presented in tandem with other major works by established m asters such a s Salvador Dalí , Marc Chagall, Pierre Bonnard , Willem de Kooning, Alexander Calder and Gerhard Richter. Together, the group of works to be exhibited carries a total value in excess of HK$ 1.6 billion / US$ 200 million. a fabulous 1937 painting of Marie - Thérèse Walter dominated a hugely successful fortnight for the artist." Pablo Picasso Homme à la pipe assis et amour signed Picasso upper left; dated 17 - 2 - 1969 on the reverse oil on canvas 195.5 by 96.5 cm. Mousquetaire à la pipe, sold by Sotheby’s in New York for $30.1 million in 2013. Pablo Picasso Enfant jouant, Claude, 1952 dated 15.4.52. on the reverse oil on canvas 65 by 54 cm. An extraordinary work that has ne ver been seen in public before and is totally fresh to the market, this painting of Picasso’s son, Claude, remained in the artist’s collection until his death in 1973 and then passed into the collection of his granddaughter, Marina Picasso. Born in 1947 to Picasso and his then lover, Françoise Gilot, Claude would have bee n five years old when this monochrome painting was produced. Picasso often drew or painted Claude and his younger sister Paloma, playing or reading together at home in Vallauris in the South of France. These tender, intimate portraits of his children are s ome of the most expressively powerful works that Picasso made during the 1950s. A painting of Paloma, dated 1954, was recently offered at auction, where it double d its pre - sale low estimate. 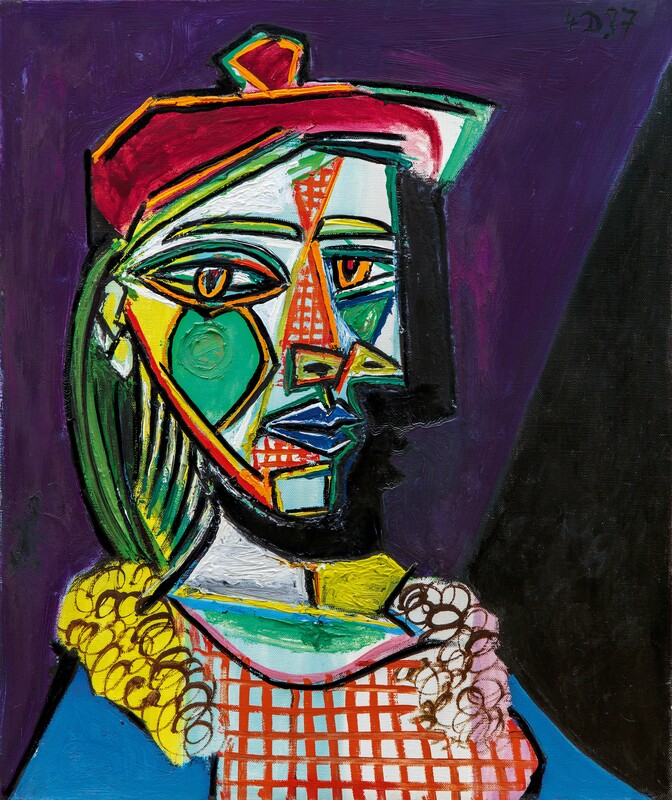 Pablo Picasso Femme à la robe verte (Femme Fleur) , 1946 o il on panel 101 by 81.5 cm. Painted in 1946, Femme à la robe (Femme Fleur) belongs to a period of Picasso’s work characterised by an increasing energy and artistic freedom after the war years. The work depicts Françoise Gilot who Picasso met in 1943, during his tumultuous relationship with Dora Maar. They settled in the south of France in the year this painting was produced, and the period that followed was marked by great personal fulfilment, during which Picasso was devoted to his family, including the couple’s two children, Claude and Paloma. Pablo Picasso Tête (Nature morte à la guitare) , 1927 - 28 oil on canvas 60 by 73 cm. Picasso was an enormously rich and varied artist, experimenting, over the course of his long career, with a host of different painterly styles, and quickly absorbing the artistic influences of those around him. 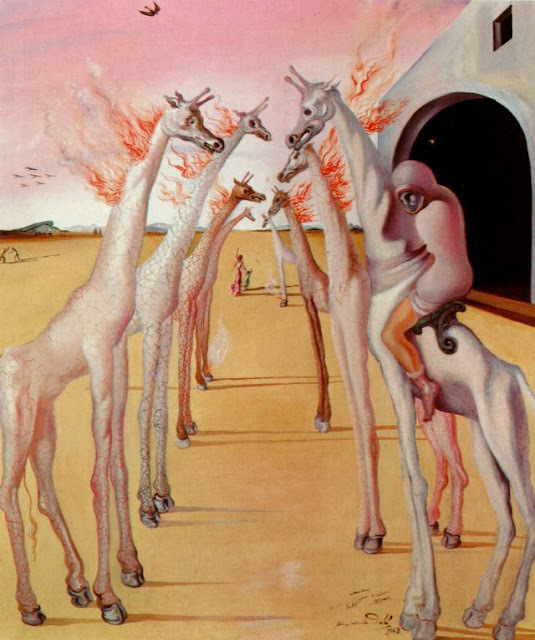 While many of his ‘styles’ were unique entirely to him, others – such as cubism, classicism and surrealism - were more obviously connected to artistic and literary movements of the moment. Figure , of 1930, made $11m against an estimate of $4 - 7m. Willem de Kooning Untitled oil on canvas 137.1 by 152.4 cm. Executed in 1977. Marc Chagall Le cirque - l'écuyère signed Marc Chagall and dated 1957 lower right oil on canvas 150.8 by 99.7 cm. 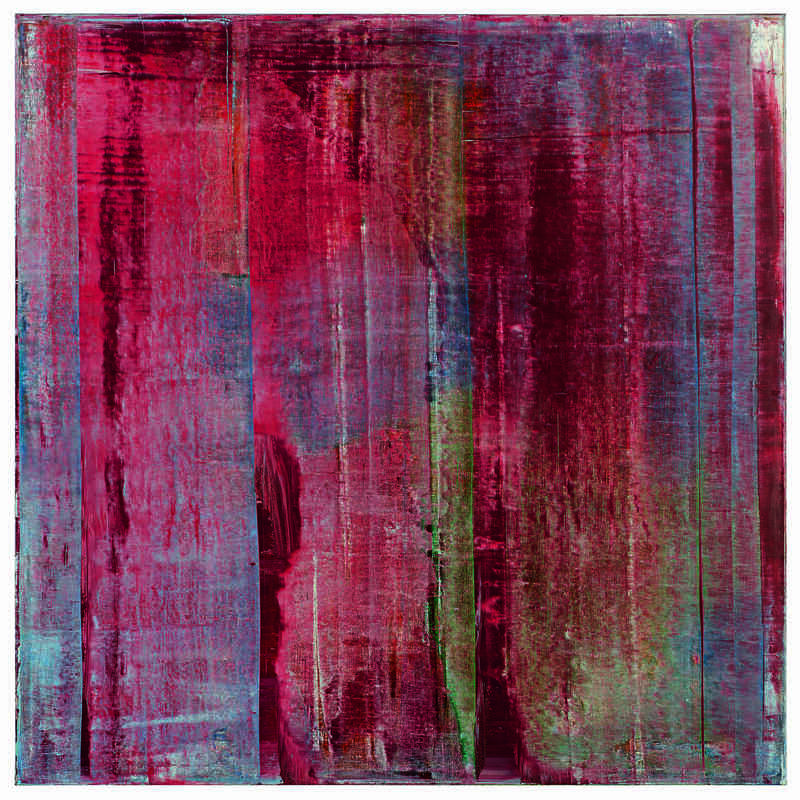 Gerhard Richter Karmin signed, dated 1994 and numbered 810 - 1 on the reverse oil on canvas 200 by 200 cm. Pierre Bonnard Marthe et son chien assise devant une table signed oil on canvas 43.3 by 44.2 cm Executed circa 1930. 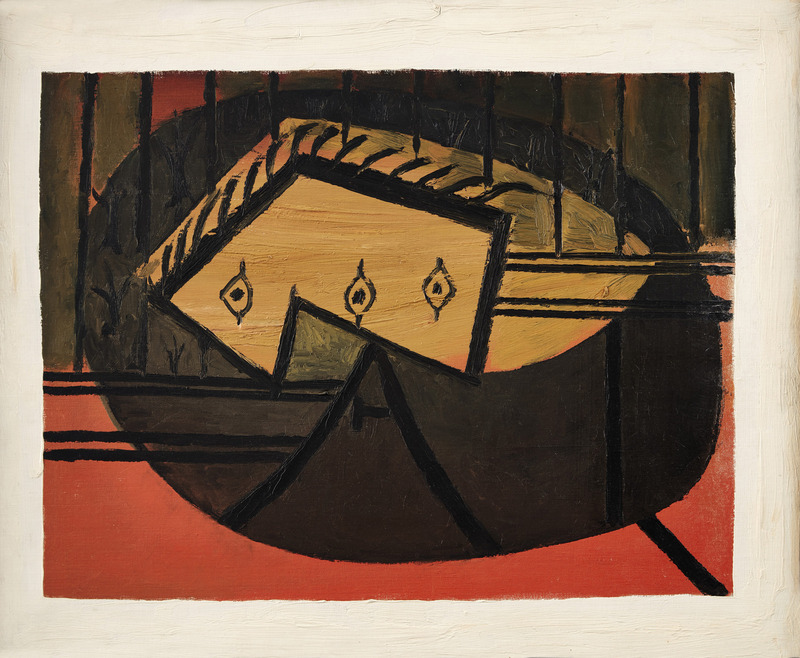 Josef Albers Study for Homage to the Square signed with the artist’s monogram and dated 72 ; stamped, titled and variously inscribed on the reverse oil on Masonite 60.9 by 60.9 cm.